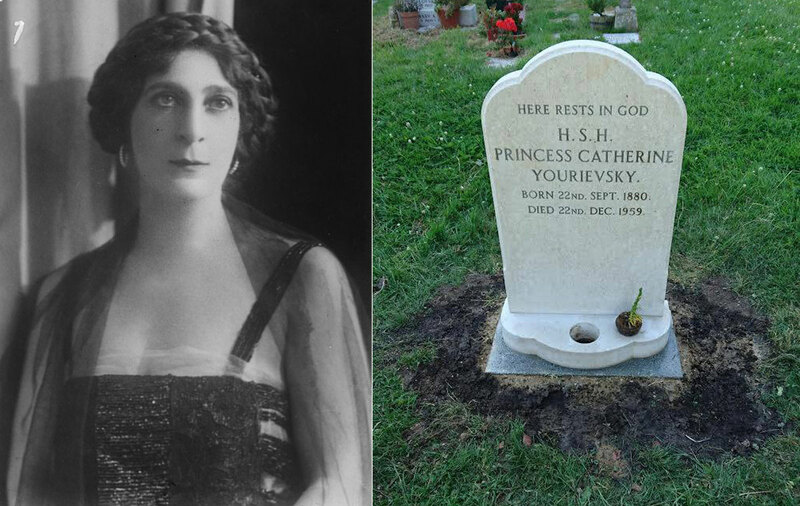 Catherina Yourievsky and her grave in the UK. One of the first projects for the recently-formed Russian Heritage Committee has been to honor the memory of Alexander II’s daughter, who was buried outside Portsmouth. A new committee dedicated to preserving Russian heritage in the United Kingdom has completed restoration work on the grave of Catherine Yourievsky, daughter of Russian emperor Alexander II. Work on the grave, located in St. Peter's cemetery on Hayling Island near Portsmouth on the south coast, was completed on July 20. The project was carried out by members of the Russian Heritage Committee together with the Orthodox Diocese of Sourozh, based in the city. Princess Catherine (1878-1959) was the child of a morganatic marriage between Alexander II and Yekaterina Dolgorukaya. After the October Revolution 1917 in Russia, Catherine emigrated to Great Britain where she became a renowned singer. She received an allowance from King George V’s widow Mary, but after Mary’s death, Catherine ended up alone without any livelihood and died in a retirement home. Established in March 2016 by the Russian diaspora in the UK, the Russian Heritage Committee aims to revive and preserve the memory of prominent Russians that lived in the country at different times.